By James H. Burns: I was raised in a home where Martin Luther King was a respected leader, and Muhammad Ali was one of the few sports heroes my Dad had as an adult. So when I saw some of the African-ethnic stereotypes in George Pal’s Puppetoons, or other shorts and films from the 1930s, and afterwards, they had no perceptible negative effect on me. My parents were raising me to believe that all people were created equal. It is still, of course, completely understandable how some people could find some of the imagery offensive. And it is extraordinary to think that these shorts were being shown on local childrens’ TV during the height of the Civil Rights Movement. But it’s a particular tragedy, because the Puppetoons, cartoon-length shorts featuring remarkable stop-motion animation, may have been the very best fantasy filmmaking George Pal was ever responsible for. The success of Pal’s series at Paramount (also known as “George Pal’s Madcap Models”), led to his feature film-making career, as both a director and producer, including Destination Moon, War of the Worlds, When Worlds Collide, Tom Thumb, and The Time Machine; and such mainstream efforts as Houdini and The Naked Jungle. Pal. a European emigrant, was heartbroken by the racist allegations against his early films. He regarded his character Jasper, a little boy who would be consistently conned by a talking scarecrow, to be on a par with Tom Sawyer, or other American fables. He created the extraordinary short, John Henry and the Inky Poo, to help show that he held nothing but respect for ALL cultures. Most of the Pal shorts haven’t been shown for decades. Some of the wonderful compilations that have been produced usually omit the majority of the Puppetoons catalog. The shorts could be presented to the modern audience, I believe, with explanatory context, in a program hosted perhaps by someone like Whoopi Goldberg, who as a New Yorker, I’m certain, also grew up with these films. Because the imagery in some of the Puppetoons remains some of the most astonishing fantasy milieus ever put on celluloid. Some of the shorts were nominated for Oscars, and other awards. I grew up with these films early in the morning, in a half-hour that also included the old “Sing Along” cartoons, and Herge’s Adventures of Tin Tin. As with The Little Rascals shorts that also ran on that era’s television, they filled me only with affection for ALL the different characters. The scenes, you’ll see, are like something out of a painting by Hannes Bok. I’ve been in love with the better nature of this material since I was a boy, and wrote one of the only, or at least one of the first histories, of the Puppetoons back in the late 1970s, which included my interview with Pal, for Fantastic Films magazine (the predecessor to Filmfax). A scene in “A Date With Duke,” starring Duke Ellington is to me, one of the most joyous expressions I’ve ever seen on film: moments which should become self-evident! If these shorts are not objectionable, perhaps we can present more. The George Pal Puppetoons are a chapter of fantasy filmmaking that perhaps again, in the 21st Century, can be safe, and wondrous, to view. This entry was posted in Like Show Business and tagged George Pal, James H. Burns by Mike Glyer. Bookmark the permalink. Fascinating history, James, and vital context. I grew up watching these and always loved them. It would be awesome for the entire available catalog of puppetoons to be presented for a modern audience. Excellent article and I thank you for writing this. There’s a great two disc Blu Ray set out which was done by B2MP, The Puppetoon Movie, which contains The Puppetoon Movie, quite a few other Puppetoons, the film The Great Rupert and some additional bonus material. The set is beautiful and includes notes on the series, by Jerry Beck. Pal’s stop-motion animation is fantastic! We’ll fix the glitch soon, but in the meantime…! The second vid clip is supposed to be “A Date With Duke,” starring Duke Ellington, the film referred to in the article as having a joyous moment… Or two! I grew up with these magical films, as well, and find them as enchanting now as they were way back in the fifties when I originally encountered them. I met George twice, and had the remarkable opportunity to share a one hour limousine ride with him in 1978. He was a sweet, gentle soul, and his films reflected that tender innocence and cinematic purity. How sad that revisionist history often tends to paint heroes as villains. These films were made out of pure love and simplicity, and deserve to be seen once more. I would love to see the anti-smoking cartoon again. (Think it was called Bedtime for Rusty). The anti-Nazi cartoons with the screwballs were also deeply disturbing. And in all fairness to the conversation, a few days later, here’s one of the aforementioned Jasper shorts. There ARE at least a couple of awful moments in the series (unintentionally, by George Pal, I’m certain). I don’t think you’ll find one here. Thanks. I saw that when I was six and it made quite an impression. I remember another where they ripped the Mona Lisa in two. These should definitely be seen but probably not by kids. Jasper’s Derby is one of the bonus cartoons included on the Blu-Ray release of The Puppetoon Movie. If memory serves, it was also one of the bonus shorts on the DVD release years ago. I, too, remember watching these early in the morning way back in the late 50s or very early 60s. All those so called banned cartoons were regularly shown on local TV in those days. Julian, if you’d be kind enough to shoot me your email, I’d appreciate it. 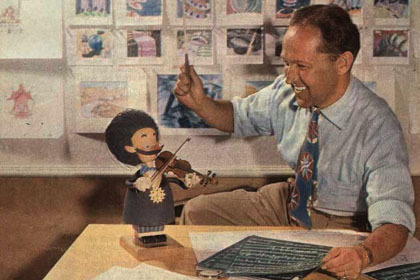 The racism in a cartoon like Hoola Boola while standard for the time period, was intentional and offensive at the time of release. Not saying they should not be shown they should, to demonstrate the long history of socially acceptable racism in the USA.